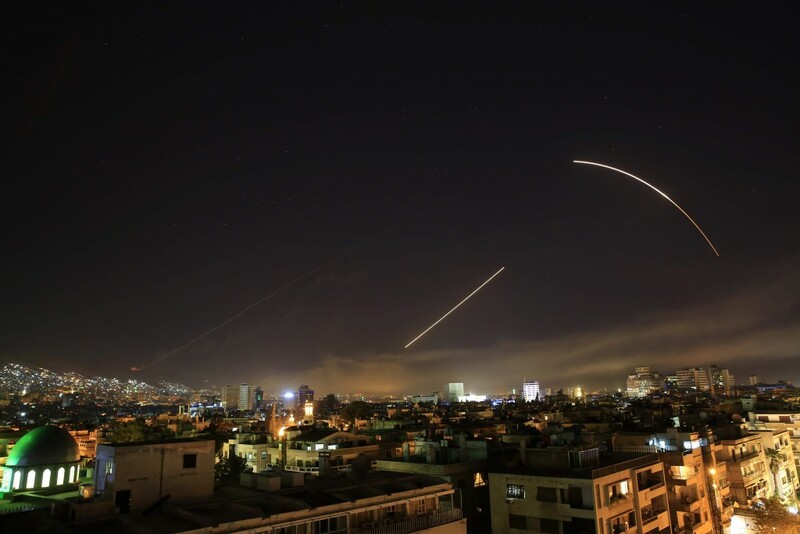 According to the Western version of the story, these bombing attacks were not aimed at overthrowing the Syrian Arab Republic (which they call « Bachar’s régime »), but to sanction the use of chemical weapons. However, no proof of the use of such weapons has been published. Instead, the three allies each broadcast evaluations based on the original video published by the White Helmets  — a video which was itself later contradicted by many of the people who appear in it, as well as the personnel of the hospital where it was filmed . The destruction of the pharmaceutical research centre in Barzeh remains a mystery. This installation was in no way secret. It had been created with the help of France. The Organisation for the Prohibition of Chemical Weapons inspected it five times and found nothing that could be linked to research on chemical weapons . According to officials, in the context of international sanctions, the laboratory was carrying out research on anti-cancer products. It was not guarded, and there were no victims in the collapse of the buildings. Neither did the collapse cause the dispersion of chemical agents into the atmosphere. This situation can not help but remind us of the destruction by the United States of the Al-Shifa factory in Sudan. In 1998, President Bill Clinton ordered its destruction, implemented by a salvo of four Tomahawk missiles, for a cost of one dead and ten wounded. The US intelligence services had assured that the laboratory was developing nerve gases for Oussama Ben Laden. It turned out later that it was Sudan’s main centre for the production of generic medicines . In particular, it made anti-AIDS medicine without paying the license to Gilead Science, a company directed by Donald Rumsfeld and George Schultz . The Allies claim to have fired 105 missiles, while the Russians counted 103 . The coordination between the different armies was handled by NATO, although it claimed no responsibility . In conformity with its statutes, the Organisation acted with the approval of the North Atlantic Council, although this is not yet certain. Indeed, the Council had not been consulted before the bombing of Tripoli (Libya), in 2011, and no-one protested. The aim of this coordination was to ensure that all the missiles fired, whether from the Mediterranean, the Red Sea, and the air, would all hit their targets at the same moment. However, things did not go as planned – although the Allied operation was to have been finished within half an hour, in fact, it took 1 hour and 46 minutes between the first and final shot. The Allies immediately specified that any more precise information was classified. However, the specialised forums proffered all sorts of unverifiable revelations about the massive failure of this operation. The most that we know for certain is that a French plane was unable to fire one of its missiles, and was obliged to jettison it out to sea without triggering it  and that two French multi-mission frigates suffered a computer failure and were unable to fire their naval Cruise missiles  — these are symptoms that are well known by anyone who has had to face up to the Russian inhibitor weapon. The Syrian defence was over-run by the number of missiles which were fired from every direction. It, therefore, chose to defend in priority certain targets, like the Presidential palace, and to sacrifice others like the research centre in Bazeh. Since then, Russia has announced that it will be delivering new anti-missile batteries to Syria. These bombings are certainly illegal from the point of view of international law – none of the three aggressors has been attacked by the Syrian Arab Republic, and their action was not authorised by the Security Council. The Allies, therefore, communicated about the legality of their initiative. This was denied by the legal service of the German Bundestag. . Indeed, apart from the fantastical character of the supposed attack in the Ghouta, this type of bombing in no way guarantees an end to the suffering of the civil population. As for France, it continually stressed that it was not going to war against « Bachar’s regime » – comments that were immediately contradicted by Syria, which returned President al-Assad’s Grand Cross of the Légion d’Honneur to the Romanian ambassador, who represents French interests in Damascus. « There is no honour for President Assad in wearing a decoration attributed to a slave régime of the United States which supports terrorists », declared the Presidential spokesman. Some authors close to NATO evoke the « responsibility of protection » (R2P) proclaimed by the UNO. Once again, that’s not the point. In fact, the R2P only applies in order to compensate failed states, which is clearly not the case of the Syrian Arab Republic, whose public services are still functioning after 7 years of war. “Witnesses take the sting out of the charge made by the White Helmets”, Translation Anoosha Boralessa, Voltaire Network, 14 April 2018. Last inspection: “Progress in the elimination of the Syrian chemical weapons programme”, by Ahmet Üzümcü, Voltaire Network, 23 March 2018. “Universalism and the West. An Agenda for Understanding”, in «The Future of War», Werner Daum, Harvard International Review, Vol. 23 (2) – Summer 2001. “War as a World Strategy”, Voltaire Network, 19 March 2003. “General Staff Colonel General Sergei Rudskoy holds briefing dealing with western attack against Syria”, by Sergei Rudskoy, Voltaire Network, 14 April 2018. “Fake “made in USA” and lies “made in Italy”, by Manlio Dinucci, Il Manifesto (Italy), Voltaire Network, 17 April 2018.